2003-12-05 Assigned to ROCHESTER, UNIVERSITY OF reassignment ROCHESTER, UNIVERSITY OF ASSIGNMENT OF ASSIGNORS INTEREST (SEE DOCUMENT FOR DETAILS). Assignors: PHIPPS, RICHARD P., SIME, PATRICIA J.
B-L-X wherein the group B is a vitamin, or an analog or a derivative thereof, that binds to a surface accessible vitamin receptor that is uniquely expressed, overexpressed, or preferentially expressed by a population of pathogenic cells, wherein the group L comprises a cleavable linker, and wherein the group X comprises a mitomycin compound, or an analog or a derivative thereof. An additional therapeutic agent, such as a chemotherapeutic agent, can be administered in combination with the conjugate. This invention relates to compositions and methods for use in treating disease states characterized by the proliferation of pathogenic cell populations. More particularly, the invention relates to vitamin-mitomycin conjugates, to a method of using the conjugates to selectively eliminate a population of pathogenic cells in a host animal, and to a method of preparation of the conjugates. The mammalian immune system provides a means for the recognition and elimination of tumor cells, other pathogenic cells, and invading foreign pathogens. While the immune system normally provides a strong line of defense, there are many instances where cancer cells, other pathogenic cells, or infectious agents evade a host immune response and proliferate or persist with concomitant host pathogenicity. Chemotherapeutic agents and radiation therapies have been developed to eliminate replicating neoplasms. However, most, if not all, of the currently available chemotherapeutic agents and radiation therapy regimens have adverse side effects because they work not only to destroy cancer cells, but they also affect normal host cells, such as cells of the hematopoietic system. The adverse side effects of the currently available anticancer drugs highlight the need for the development of new therapies specific for pathogenic cell populations and with reduced host toxicity. Researchers have developed therapeutic protocols for destroying cancer cells by targeting cytotoxic compounds to such cells. Many of these protocols utilize toxins conjugated to antibodies that bind to antigens unique to or overexpressed by cancer cells in an attempt to minimize delivery of the toxin to normal cells. Using this approach certain immunotoxins have been developed consisting of antibodies directed to specific antigens on pathogenic cells, the antibodies being linked to toxins such as ricin, Pseudomonas exotoxin, Diptheria toxin, and tumor necrosis factor. These immunotoxins target tumor cells bearing the specific antigens recognized by the antibody (Olsnes, S., Immunol. Today, 10, pp. 291-295, 1989; Melby, E. L., Cancer Res., 53(8), pp. 1755-1760, 1993; Better, M. D., PCT Publication Number WO 91/07418, published May 30, 1991). Although the immunotoxins are directed to specific antigens on pathogenic cells, the toxin component of these compounds may exhibit toxicity to normal host cells. The use of vitamins to deliver chemotherapeutic agents to cells has also been described (see U.S. Pat. No. 5,416,016). Another approach for targeting populations of cancer cells or foreign pathogens in a host is to enhance the host immune response against the pathogenic cells to avoid the need for administration of compounds that may also exhibit independent host toxicity. One reported strategy for immunotherapy is to bind antibodies, for example, genetically engineered multimeric antibodies, to the tumor cell surface to display the constant region of the antibodies on the cell surface and thereby induce tumor cell killing by various immune-system mediated processes (De Vita, V. T., Biologic Therapy of Cancer, 2d ed. Philadelphia, Lippincott, 1995; Soulillou, J. P., U.S. Pat. No. 5,672,486). However, these approaches have been complicated by the difficulties in defining tumor-specific antigens. Thus, there remains a significant need for effective therapies with minimized host toxicity directed to the treatment of disease states characterized by the existence of pathogenic cell populations in the affected host. 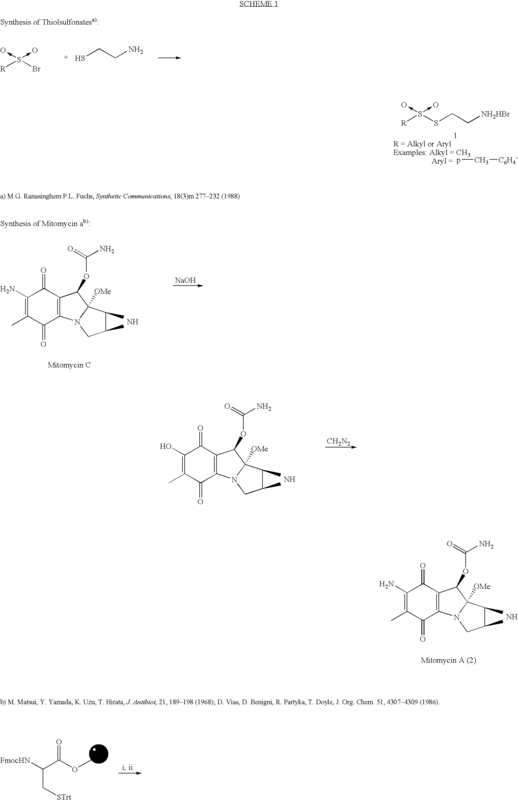 Mitomycins are natural products known to exhibit anti-tumor activity. 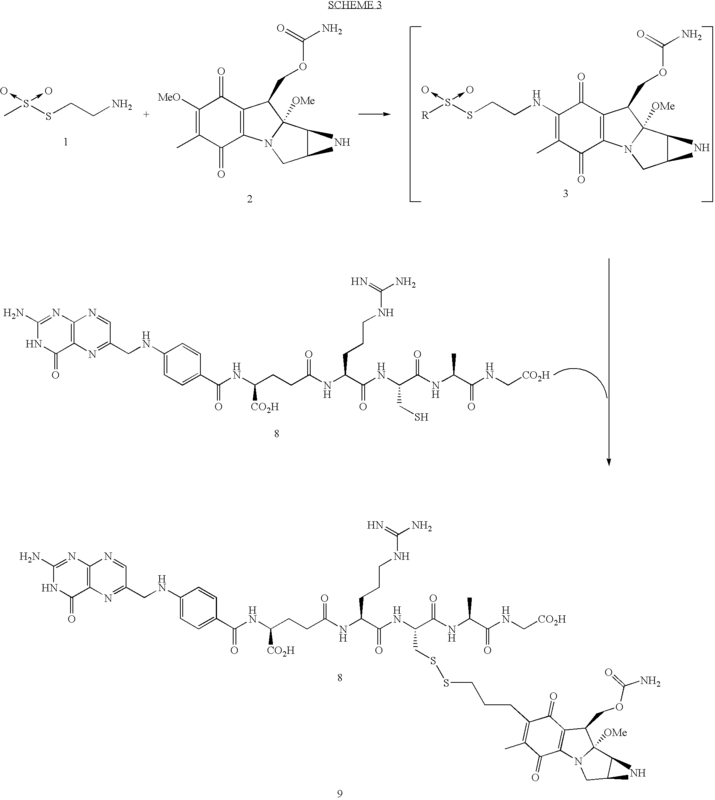 Mitomycins can be produced by fermentation of Streptomyces caespitosus, and representive known mitomycins include mitomycin A, mitomycin B, mitomycin C, mitomycin D, mitomycin E, mitomycin F, and porfiromycin. The structures of these compounds are depicted by the following generic formula with substituents as shown in Table 1. Mitomycins are a class of cytotoxic drugs known as quinone-containing alkylating agents. Reduction of the quinone moiety results in the formation of bi-functional alkylating species that can form covalent bonds with a variety of cellular components including DNA. The interaction with DNA results in the formation of DNA crosslinks leading to the induction of apoptosis and cell death, and this interaction is thought to be the most important contributor to the anti-tumor activity of mitomycin compounds. The present invention relates to conjugates comprising a vitamin moiety linked to a mitomycin compound by a cleavable linker, to their use in the treatment of disease states characterized by the proliferation of a pathogenic cell population, and to a method of preparation of the conjugates. The vitamin-mitomycin conjugates in accordance with the invention can be used to selectively eliminate a population of pathogenic cells in an affected host. The selective elimination of the pathogenic cells is mediated by the binding of the vitamin moiety of the vitamin-mitomycin conjugate to a vitamin receptor, transporter, or other surface-presented protein that specifically binds the targeting vitamin, and which is uniquely expressed, overexpressed, or preferentially expressed by the pathogenic cells. The vitamin-mitomycin conjugates can be internalized into the targeted cells upon binding of the vitamin moiety to such a receptor, transporter, or surface-expressed protein, and, with the presence of a cleavable linker used to conjugate the vitamin moiety to the mitomycin compound, the vitamin moiety and the mitomycin compound can dissociate intracellularly. The dissociated mitomycin compound thereafter interacts with DNA, such as by forming crosslinks with DNA, resulting in killing or inhibition of proliferation of the pathogenic cells. Surface-expressed vitamin receptors, such as the high-affinity folate receptor, are overexpressed, for example, on cancer cells. Epithelial cancers of the ovary, mammary gland, colon, lung, nose, throat, and brain have all been reported to express elevated levels of the folate receptor. In fact, greater than 90% of all human ovarian tumors are known to express large amounts of this receptor. Accordingly, the present invention can be used for killing or inhibiting the proliferation of a variety of tumor cell types, and of other types of pathogenic cells that overexpress vitamin receptors. Although mitomycins are known to exhibit excellent anti-tumor activity, mitomycins also exhibit cytoxicity towards leukocytes in the host animal treated with these compounds. 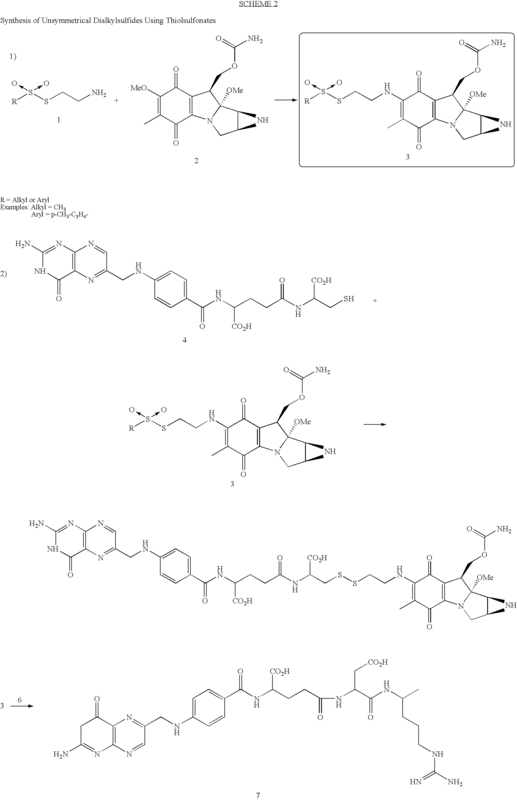 In an effort to increase the anti-tumor activity of mitomycins and/or to decrease the undesired toxicity of these compounds, derivatives of mitomycins have been prepared which contain a variety of modifications at the C-7-amino group in the aminomitosane skeleton. Among the known mitomycin derivatives with reduced toxicity are unsymmetrical dialkyl disulfides containing C-7 substituents of the formula RSS(CH2)2NH— in which i) R is an alkyl group (see European Patent Application No. 0116208A1 and Japanese Patent Application No. 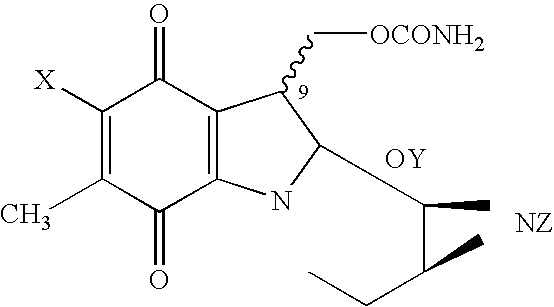 175493/84), ii) R contains an aromatic ring (see European Patent Application Nos. 0116208A1 and 0163550A2, Japanese Patent Application No. 255789/85, and U.S. Pat. No. 4,866,180), and iii) R is structurally related to amino acid or peptide fragments (see European Patent Application No. 0163550A2, Japanese Patent Application No. 255789/85, and U.S. Pat. No. 4,691,024). The vitamin-mitomycin conjugates in accordance with the present invention can be prepared using such transthiolation methods or, for example, by a novel process for the preparation of unsymmetrical dialkyl disulfides that is based on the thiophilicity of thiosulfonate reagents. The synthetic scheme for the preparation of the thiosulfonate reagents, mitomycin A, and for the synthesis of a vitamin derivative (e.g., cysteine-terminated folate) for use in this preparation process is shown in scheme 1 below (Fmoc=9-fluorenylmethyloxycarbonyl; Boc=tert-butyloxycarbonyl; Dap=diaminopropionic acid; DMF=dimethylformamide; DIPEA=diisopropylethylamine; DMSO=dimethylsulfoxide; TFAA=trifluoroacetic acid; PyBOP=benzotriazole-1-yl-oxy-tris-(pyrrolidinophosphoniumhexafluoro-phosphate)). 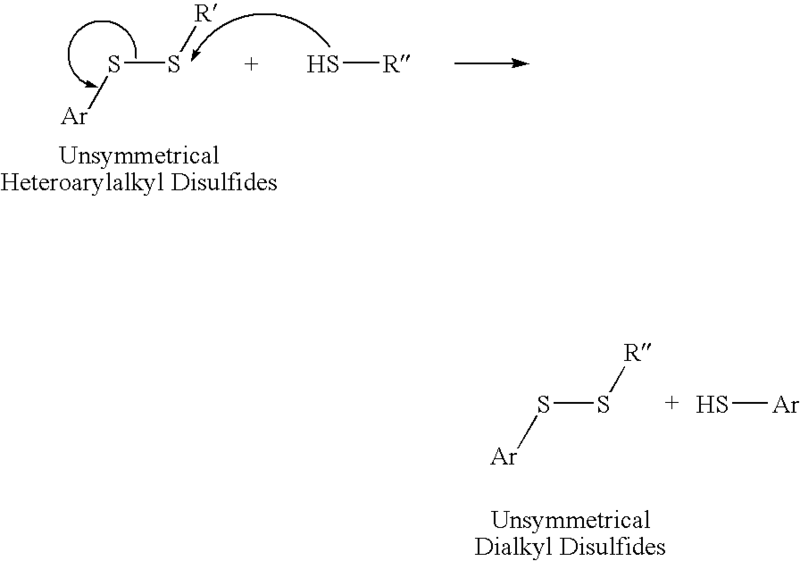 Exemplary synthetic schemes for the synthesis of the present vitamin-mitomycin conjugates as unsymmetrical dialkylsulfides using thiosulfonates are presented as schemes 2 and 3 below. In the disulfide-linked conjugates, one of the alkyl moieties is attached to the C-7-amino group in the mitosane skeleton, and the other is covalently attached via a divalent linker or directly to a vitamin molecule, or a vitamin receptor binding analog or derivative thereof. In both schemes 2 and 3, a commercially available amine 1, containing a thiolsulfonate group, was first reacted with the vinylogous methyl ester at C-7 in the quinone moiety of the mitosane derivative 2. Second, the resulting thiolsulfonate reagent 3 is used for sulfonylation of thiols, such as that found on pteroyl-glutamyl-cysteine 4, on Pte-Glu-Asp-Arg-Asp-Cys-OH 6, or Pte-Glu-Arg-Cys-Ala-Gly-OH 8, which are all folic acid derivatives. The instantaneous disulfide formation produces a vitamin-mitomycin conjugate, for example, a pteroyl-Glu-Cys-S-mitomycin C conjugate 5, a Pte-Glu-Asp-Arg-Asp-Cys-S-mitomycin C—OH conjugate 7, or a Pte-Glu-Arg-Cys-S-mitomycin C-Ala-Gly-O conjugate 9, in almost quantitative yield. In embodiments of the present invention where the disulfide linkage is an unsymmetrical dialkyl disulfide, such as an unsymmetrical dialkyl disulfide prepared by the above-described procedure, the vitamin-mitomycin conjugates selectively eliminate the pathogenic cells, and have reduced toxicity towards normal cells. In embodiments where the vitamin moiety is conjugated to a mitomycin compound by such a disulfide linkage, the vitamin moiety and mitomycin compound can dissociate under the reducing conditions that exist intracellularly. wherein the group B is a vitamin, or an analog or a derivative thereof, that binds to a surface accessible vitamin receptor that is uniquely expressed, overexpressed, or preferentially expressed by a population of pathogenic cells, wherein the group L comprises a cleavable linker, and wherein the group X comprises a mitomycin compound or an analog or a derivative thereof. wherein the group B is a vitamin, or an analog or a derivative thereof, that binds to a surface accessible vitamin receptor that is uniquely expressed, overexpressed, or preferentially expressed by the population of pathogenic cells, wherein the group L comprises a cleavable linker, and wherein the group X comprises a mitomycin compound or an analog or a derivative thereof, and selectively eliminating the population of pathogenic cells. In an alternate embodiment, the method can further comprise the step of administering to the host animal a chemotherapeutic agent such as paclitaxel. wherein the group B is a vitamin, or an analog or a derivative thereof, that binds to a surface accessible vitamin receptor that is uniquely expressed, overexpressed, or preferentially expressed by a population of pathogenic cells, wherein the group L comprises a cleavable linker, and wherein the group X comprises a mitomycin compound or an analog or a derivative thereof, and a pharmaceutically acceptable carrier therefor. In another embodiment, the pharmaceutical composition can further comprise a chemotherapeutic agent such as paclitaxel. R is alkyl, substituted alkyl, aryl, heteroaryl or substituted aryl or heteroaryl. FIG. 1 shows a comparison between the cytotoxicities of EC72 (see scheme 1; closed triangles) and mitomycin C (closed squares). The cytotoxicity of EC72 in the presence of excess free folate (closed circles) is also shown. FIG. 2 shows the percentage survival of M109 tumor-bearing mice injected with PBS (control; closed squares), mitomycin C (open circles), or EC72 (closed circles). FIG. 3 shows the percentage survival of M109 tumor-bearing mice injected with PBS (control; closed triangles), mitomycin C (closed squares), EC72 (closed circles), or EC72 plus excess free folate (closed diamonds). FIG. 4 shows tumor size in mice implanted with M109 cells to form subcutaneous tumors and treated with PBS (closed squares) or EC72 (closed circles). FIG. 5 shows 1D NMR of a pteroyl-Glu-Cys-S-mitomycin C conjugate (compound 5; see scheme 2), a Pte-Glu-Asp-Arg-Asp-Cys-S-mitomycin C—OH conjugate (compound 7; see scheme 2), and a Pte-Glu-Arg-Cys-S-mitomycin C-Ala-Gly-O conjugate (compound 9; see scheme 3). FIG. 6 shows 2D NMR of a pteroyl-Glu-Cys-S-mitomycin C conjugate (compound 5; see scheme 2), a Pte-Glu-Asp-Arg-Asp-Cys-S-mitomycin C—OH conjugate (compound 7; see scheme 2), and a Pte-Glu-Arg-Cys-S-mitomycin C-Ala-Gly-O conjugate (compound 9; see scheme 3). FIG. 7 shows tumor size in mice implanted with M109 cells to form subcutaneous tumors and treated with PBS (closed squares) or taxol (20 mg/kg; open circles), or taxol plus EC72 (closed circles). FIG. 8 shows tumor size in mice implanted with M109 cells to form subcutaneous tumors and treated with PBS (closed squares) or taxol (15 mg/kg; open circles), or taxol plus EC72 (closed circles). FIG. 9 shows 3H-folic acid binding to KB cells in the presence of increasing concentrations of free folic acid (lower curve) or EC72 (upper curve). FIG. 10 shows the inhibition of KB cell DNA synthesis by increasing concentrations of EC72 (closed circles) or EC72 in the presence of 0.1 mM free folate (open circles). FIG. 11 shows the percentage survival of M109 tumor-bearing mice injected with PBS (control; closed squares) or increasing concentrations of EC72 (closed diamonds=100 nmol/kg of EC72, closed triangles=400 nmol/kg of EC72, and closed circles=1800 nmol/kg of EC72). FIG. 12 shows tumor size in mice implanted with folate receptor-negative 4T-1 cells to form subcutaneous tumors and treatment with PBS (closed squares) or EC72 (closed circles). The present invention relates to conjugates comprising a vitamin moiety linked to a mitomycin compound by a cleavable linker. The vitamin-mitomycin conjugates in accordance with the invention can be used to selectively eliminate a population of pathogenic cells in an affected host. The selective elimination of the pathogenic cells is mediated by the binding of the vitamin moiety of the vitamin-mitomycin conjugate to a vitamin receptor, transporter, or other surface-presented protein that specifically binds vitamins or vitamin analogs and which is uniquely expressed, overexpressed, or preferentially expressed by the pathogenic cells. A surface-presented protein uniquely expressed, overexpressed, or preferentially expressed by the pathogenic cells is preferably a receptor not present or present at lower concentrations on non-pathogenic cells providing a means for selective elimination of the pathogenic cells. The vitamin-mitomycin conjugates are internalized upon binding of the vitamin moiety to such a receptor, transporter, or surface-expressed protein and the vitamin moiety and the mitomycin compound can dissociate intracellularly upon cleavage of a cleavable linker used to covalently link the vitamin moiety to the mitomycin compound. The cleavable linker can be, for example, a disulfide linkage which results in reduced toxicity of the vitamin-mitomycin conjugate towards normal cells. In embodiments where the vitamin moiety is conjugated to a mitomycin compound by a disulfide linkage, the vitamin moiety and mitomycin compound can dissociate under the reducing conditions that exist intracellularly. Upon its dissociation from the vitamin moiety, the mitomycin compound can interact with DNA, such as by forming crosslinks with DNA, resulting in killing or inhibiting the proliferation of the pathogenic cells. In an alternative embodiment, the vitamin moiety of the conjugate can bind to the pathogenic cell placing the mitomycin compound in close association with the cell surface. The drug can then be released by cleavage of the disulfide linkage, for example, by a protein disulfide isomerase. The mitomycin compound can be taken up by the pathogenic cell to which the vitamin-mitomycin conjugate is bound, or the mitomycin compound can be taken up by another pathogenic cell in close proximity thereto to interact with the cell's DNA and kill or inhibit proliferation of the pathogenic cell. Alternatively, the drug could be released by a protein disulfide isomerase inside the cell where the releasable linker is a disulfide group. In another embodiment, or in combination with the above-described embodiments, the vitamin-mitomycin conjugates can act through a mechanism independent of cellular vitamin receptors. For example, the conjugates can bind to soluble vitamin receptors present in the serum or to serum proteins, such as albumin, resulting in prolonged circulation of the conjugates relative to unconjugated mitomycin, and in increased activity of the conjugates towards the pathogenic cell population relative to unconjugated mitomycin. The vitamin-mitomycin conjugates in accordance with the invention are utilized to selectively eliminate a population of pathogenic cells in a host animal harboring the population of pathogenic cells. The invention is applicable to populations of pathogenic cells that cause a variety of pathologies including cancer, diseases mediated by activated macrophages, and diseases mediated by any other type of pathogenic cells that overexpress vitamin receptors or receptors that bind analogs or derivatives of vitamins. Thus, the population of pathogenic cells can be a cancer cell population that is tumorigenic, including benign tumors and malignant tumors, or it can be non-tumorigenic. The cancer cell population can arise spontaneously or by such processes as mutations present in the germline of the host animal or somatic mutations, or it can be chemically-, virally-, or radiation-induced. The invention can be utilized to treat such cancers as carcinomas, sarcomas, lymphomas, Hodgekin's disease, melanomas, mesotheliomas, Burkitt's lymphoma, nasopharyngeal carcinomas, leukemias, and myelomas. The cancer cell population can include, but is not limited to, oral, thyroid, endocrine, skin, gastric, esophageal, laryngeal, pancreatic, colon, bladder, bone, ovarian, cervical, uterine, breast, testicular, prostate, rectal, kidney, liver, and lung cancers. In embodiments where the pathogenic cell population is a cancer cell population, the effect of conjugate administration is a therapeutic response measured by reduction or elimination of tumor mass, maintenance of tumor mass, or of inhibition of tumor cell proliferation. In the case of a tumor, the elimination can be an elimination of cells of the primary tumor or of cells that have metastasized or are in the process of dissociating from the primary tumor. A prophylactic treatment with the vitamin-mitomycin conjugate to prevent return of a tumor after its removal by any therapeutic approach including surgical removal of the tumor, radiation therapy, chemotherapy, or biological therapy is also contemplated in accordance with this invention. The prophylactic treatment can be an initial treatment with the vitamin-mitomycin conjugate, such as treatment in a multiple dose daily regimen, and/or can be an additional treatment or series of treatments after an interval of days or months following the initial treatments(s). Accordingly, elimination of the pathogenic cell population includes elimination of cells, inhibition of proliferation of pathogenic cells, maintenance of tumor mass, or a prophylactic treatment that prevents return of pathogenic cells. The method of the present invention can be used for both human clinical medicine and veterinary applications. Thus, the host animal harboring the population of pathogenic cells and treated with vitamin-mitomycin conjugates can be human or, in the case of veterinary applications, can be a laboratory, agricultural, domestic, or wild animal. The present invention can be applied to host animals including, but not limited to, humans, laboratory animals such rodents (e.g., mice, rats, hamsters, etc. ), rabbits, monkeys, chimpanzees, domestic animals such as dogs, cats, and rabbits, agricultural animals such as cows, horses, pigs, sheep, goats, and wild animals in captivity such as bears, pandas, lions, tigers, leopards, elephants, zebras, giraffes, gorillas, dolphins, and whales. In accordance with the present invention, the vitamin-mitomycin conjugates can be formed from a wide variety of vitamins or receptor-binding vitamin analogs/derivatives and mitomycins. The vitamin-mitomycin conjugates are capable of selectively targeting a population of pathogenic cells in the host animal due to preferential expression of a receptor for the vitamin, accessible for vitamin binding, on the pathogenic cells. Acceptable vitamin moieties include niacin, pantothenic acid, folic acid, riboflavin, thiamine, biotin, vitamin B12, and the lipid soluble vitamins A, D, E and K. These vitamins, and their receptor-binding analogs and derivatives, constitute the targeting entity that can be coupled with mitomycins by a cleavable linker to form the vitamin-mitomycin conjugates for use in accordance with the invention. Preferred vitamin moieties include folic acid, biotin, riboflavin, thiamine, vitamin B12, and receptor-binding analogs and derivatives of these vitamin molecules, and other related vitamin receptor-binding molecules (see U.S. Pat. No. 5,688,488, incorporated herein by reference). Exemplary of a vitamin analog is a folate analog containing a glutamic acid residue in the D configuration (folic acid normally contains one glutamic acid in the L configuration linked to pteroic acid). The mitomycin compound can be any of the mitomycins or mitomycin-related compounds shown in Table 1 including mitomycin A, mitomycin B, mitomycin C, mitomycin D, mitomycin E, mitomycin F, mitomycin J, and porfiromycin, or analogs or derivatives thereof. The binding site for the vitamin can include receptors for any vitamin molecule, or a derivative or analog thereof, capable of specifically binding to a receptor wherein the receptor or other protein is uniquely expressed, overexpressed, or preferentially expressed by a population of pathogenic cells. A surface-presented protein uniquely expressed, overexpressed, or preferentially expressed by the pathogenic cells is typically a receptor that is either not present or present at lower concentrations on non-pathogenic cells providing a means for selective elimination of the pathogenic cells. In one embodiment, ligands that can be used in the conjugates of the present invention include those that bind to receptors expressed specifically on activated macrophages, such as the folate receptor, which binds folate or an analog or derivative thereof. In accordance with the invention the vitamin-mitomycin conjugates are capable of high affinity binding to receptors on cancer cells or other pathogenic cells. The high affinity binding can be inherent to the vitamin moiety or the binding affinity can be enhanced by the use of a chemically modified vitamin (i.e., an analog or a derivative) or by the particular chemical linkage between the vitamin and the mitomycin compound that is present in the conjugate. The linker can be any biocompatible cleavable linker, such as a linker susceptible to cleavage under the reducing conditions present in cells, an acid-labile linker, or an enzyme-labile linker. Typically, the linker comprises about 1 to about 30 carbon atoms, more typically about 2 to about 20 carbon atoms. Lower molecular weight linkers (i.e., those having an approximate molecular weight of about 30 to about 300) are typically employed. Generally, any manner of forming a complex between the linker and the vitamin, or vitamin receptor binding derivative or analog, and between the linker and the mitomycin can be utilized in accordance with the present invention. The complex can be formed by direct conjugation of the cleavable linker with the vitamin and the mitomycin, for example, through hydrogen, ionic, or covalent bonds. Covalent bonding of the vitamin, or vitamin receptor binding derivative or analog, and the mitomycin with the linker can occur, for example, through the formation of amide, ester, disulfide, or imino bonds between acid, aldehyde, hydroxy, amino, sulfhydryl, or hydrazo groups. Also, in accordance with this invention the linker can comprise an indirect means for associating the vitamin with the mitomycin, such as by connection through intermediary linkers, spacer arms, or bridging molecules. Both direct and indirect means for association should not prevent the binding of the vitamin, or vitamin receptor binding derivative or analog, to the vitamin receptor on the cell membrane for operation of the method of the present invention. and L is a divalent linker comprising a disulfide bond, said method comprising the steps of forming a thiosulfonate intermediate of the formula B-(L′)nSSO2R or an intermediate of the formula X-(L′)nSSO2R. The nature of the linking groups L′ and L″ in the intermediates are not critical except that the linkers are preferably cleavable; nor is the nature of the group R on the thiosulfonate critical to the preparation of the vitamin conjugates. Precursors to such linking groups are typically selected to have either nucleophilic or electrophilic functional groups, or both, optionally in a protected form with a readily cleavable protecting group to facilitate their use in synthesis of the intermediate species. The linking group -L- in the conjugate, by virtue of the synthetic preparative procedure, can be represented as a composite of the intermediate linking group L′ and L″ by the formula -(L′)n-S—S-(L″)n′-. In the case of -L′-, the entity X-(L′)n-SH should retain cytotoxic activity. The invention is also directed to pharmaceutical compositions comprising an amount of a vitamin-mitomycin conjugate effective to eliminate a population of pathogenic cells in a host animal when administered in one or more doses. The vitamin-mitomycin conjugate is preferably administered to the host animal parenterally, e.g., intradermally, subcutaneously, intramuscularly, intraperitoneally, intravenously, or intrathecally. Alternatively, the conjugate can be administered to the host animal by other medically useful processes, and any effective dose and suitable therapeutic dosage form, including prolonged release dosage forms, can be used. The method of the present invention can be used in combination with surgical removal of a tumor, radiation therapy, chemotherapy, or biological therapies such as other immunotherapies including, but not limited to, monoclonal antibody therapy, treatment with immunomodulatory agents, adoptive transfer of immune effector cells, treatment with hematopoietic growth factors, cytokines and vaccination. Examples of parenteral dosage forms include aqueous solutions of the active agent, in an isotonic saline, 5% glucose or other well-known pharmaceutically acceptable liquid carriers such as liquid alcohols, glycols, esters, and amides. The parenteral dosage form in accordance with this invention can be in the form of a reconstitutable lyophilizate comprising the dose of the vitamin-mitomycin conjugate. In one preferred aspect of the present embodiment, any of a number of prolonged release dosage forms known in the art can be administered such as, for example, the biodegradable carbohydrate matrices described in U.S. Pat. Nos. 4,713,249; 5,266,333; and 5,417,982, the disclosures of which are incorporated herein by reference, or, alternatively, a slow pump (e.g., an osmotic pump) can be used. At least one additional composition comprising a therapeutic factor can be administered to the host in combination or as an adjuvant to the above-detailed methodology, to enhance the vitamin-mitomycin mediated elimination of the population of pathogenic cells, or more than one additional therapeutic factor can be administered. The therapeutic factor(s) can be selected from a compound capable of stimulating an endogenous immune response, a chemotherapeutic agent, or another therapeutic factor capable of complementing the efficacy of the administered vitamin-mitomycin complex. The method of the invention can be performed by administering to the host, in addition to the above-described conjugates, compounds or compositions capable of stimulating an endogenous immune response including, but not limited to, cytokines or immune cell growth factors such as interleukins 1-18, stem cell factor, basic FGF, EGP, G-CSF, GM-CSF, FLK-2 ligand, HILDA, MIP-1α, TGF α, TGF β, M-CSF, IFN α, IFN β, IFN γ, soluble CD23, LIF, and combinations thereof. Therapeutically effective combinations of these factors can be used. In one embodiment, for example, therapeutically effective amounts of IL-2, for example, in amounts ranging from about 5000 IU/dose/day to about 500,000 IU/dose/day in a multiple dose daily regimen, or, for example, in amounts ranging from about 7500 IU/dose/day to about 150,000 IU/dose/day in a multiple dose daily regimen, can be used along with the vitamin-mitomycin conjugates to eliminate pathogenic cells in a host animal harboring such a population of cells. Alternatively, IL-2 can be used in combination with IFN-α where IL-2 can be used, for example, in amounts ranging from 0.1 MIU/m2/dose/day to about 15 MIU/m2/dose/day in a multiple dose daily regimen, and IFN-α, for example, can be used in amounts ranging from about 0.1 MIU/m2/dose/day to about 7.5 MIU/m2/dose/day in a multiple dose daily regimen, along with the conjugates to eliminate or neutralize pathogenic cells in a host animal harboring the pathogenic cells (MIU=million international units; m2=approximate body surface area of an average human). In another embodiment IL-12 and IFN-α are used in therapeutically effective amounts, and in yet another embodiment OL-15 and IFN-α are used in therapeutically effective amounts. In an alternate embodiment IL-2, IFN-α or IFN-γ, and GM-CSF are used in combination. The invention also contemplates the use of any other effective combination of cytokines including combinations of other interleukins and interferons and colony stimulating factors. Chemotherapeutic agents, which are cytotoxic themselves, can work to enhance tumor permeability, can inhibit tumor growth or tumor cell proliferation, and the like, are also suitable for use in the method of the invention in combination with vitamin-mitomycin conjugates. Such chemotherapeutic agents include adrenocorticoids, alkylating agents, antiandrogens, antiestrogens, androgens, estrogens, antimetabolites such as cytosine arabinoside, purine analogs, pyrimidine analogs, and methotrexate, actinomycin D, gemcitabine, busulfan, carboplatin, chlorambucil, cisplatin and other platinum compounds, trimethoprim, dicloxacillin, daunorubicin, doxorubicin, epirubicin, mitoxantrone, topotecan, etoposide, tamoxiphen, TAXOL® (i.e., paclitaxel), cyclophosphamide, cyclosporin, plant alkaloids, prednisone, hydroxyurea, teniposide, bleomycin, digoxin, nitrogen mustards, nitrosureas, vincristine, vinblastine, mitomycin C, inflammatory and proinflammatory agents, and any other art-recognized chemotherapeutic agent. The additional therapeutic factor can be administered to the host animal prior to, after, or at the same time as the vitamin-mitomycin conjugate and the therapeutic factor can be administered as part of the same composition containing the conjugate or as part of a different composition than the vitamin-mitomycin conjugate. Any such therapeutic composition containing the therapeutic factor at a therapeutically effective dose can be used in the present invention including compositions containing multiple therapeutic factors. In one embodiment, the additional therapeutic factor is TAXOL® (i.e., paclitaxel; sold by Bristol Myers Squibb Company under the trademark TAXOL® and by Ivax Corporation under the trademark ONXOL™). In accordance with this invention, TAXOL®, ONXOL™, any other generic form of TAXOL®, or any related compound can be used in combination with the vitamin-mitomycin conjugates. TAXOL®, generic forms of TAXOL®, or related compounds can be administered, for example, to patients at doses of about 10 to about 500 mg/square meter, about 50 to about 400 mg/square meter, about 100 to about 300 mg/square meter, or about 100 to about 200 mg/square meter, but any effective dose in combination with the vitamin-mitomycin conjugates can be used. Additionally, any effective regimen for administering TAXOL®, generic forms of TAXOL®, or a related compound can be used. For example, TAXOL® or generic or related compounds can be administered over 3 hours once every 3 weeks for a total of 18 weeks, but any other effective regimen is contemplated in accordance with this invention. TAXOL® or generic or related compounds can be administered by any effective route such as orally or parenterally, e.g., intradermally, subcutaneously, intramuscularly, intraperitoneally, intravenously, or intrathecally. More than one type of drug delivery conjugate can be used. For example, the host animal can be treated with conjugates with different vitamins (e.g., folate-mitomycin conjugates and vitamin B12-mitomycin conjugates) in a co-dosing protocol. In other embodiments, the host animal can be treated with conjugates comprising various vitamins linked to various mitomycins. For example, the host animal could be treated with a folate-mitomycin C and a folate-mitomycin A conjugate, or with a folate-mitomycin C conjugate and a vitamin B12-mitomycin A conjugate. Furthermore, drug delivery conjugates with the same or different vitamins and the same or different mitomycins comprising multiple vitamins and multiple mitomycins as part of the same drug delivery conjugate could be used. The unitary daily dosage of the vitamin-mitomycin conjugate can vary significantly depending on the host condition, the disease state being treated, the molecular weight of the conjugate, its route of administration and tissue distribution, and the possibility of co-usage of other therapeutic treatments such as radiation therapy. The effective amount to be administered to a patient is based on body surface area, patient weight, and physician assessment of patient condition. An effective dose can range from about 1 ng/kg to about 1 mg/kg, more preferably from about 1 μg/kg to about 500 μg/kg, and most preferably from about 1 μg/kg to about 100 μg/kg. Any effective regimen for administering the vitamin-mitomycin conjugate can be used. For example, the vitamin-mitomycin conjugate can be administered as single doses, or it can be divided and administered as a multiple-dose daily regimen. Further, a staggered regimen, for example, one to three days per week can be used as an alternative to daily treatment, and for the purpose of defining this invention such intermittent or staggered daily regimen is considered to be equivalent to every day treatment and within the scope of this invention. In one embodiment of the invention the host is treated with multiple injections of the vitamin-mitomycin conjugate to eliminate the population of pathogenic cells. In one embodiment, the host is injected multiple times (preferably about 2 up to about 50 times) with the vitamin-mitomycin conjugate, for example, at 12-72 hour intervals or at 48-72 hour intervals. Additional injections of the vitamin-mitomycin conjugate can be administered to the patient at an interval of days or months after the initial injections(s) and the additional injections prevent recurrence of the disease state caused by the pathogenic cells. Any additional therapeutic factor, such as a chemotherapeutic agent (e.g., paclitaxel), can also be administered after initial injections to prevent recurrence of disease. In one embodiment, ligands that can be used in the conjugates of the present invention include those that bind to receptors expressed specifically on activated macrophages, such as the folate receptor which binds folate, or an analog or derivative thereof. The folate-mitomycin conjugates can be used to kill or suppress the activity of activated macrophages that cause disease states in the host. Such macrophage targeting conjugates, when administered to a patient suffering from an activated macrophage-mediated disease state, work to concentrate and associate the conjugated mitomycin in the population of activated macrophages to kill the activated macrophages or suppress macrophage function. Elimination or deactivation of the activated macrophage population works to stop or reduce the activated macrophage-mediated pathogenesis characteristic of the disease state being treated. Exemplary of diseases known to be mediated by activated macrophages include rheumatoid arthritis, ulcerative colitis, Crohn's disease, psoriasis, osteomyelitis, multiple sclerosis, atherosclerosis, pulmonary fibrosis, sarcoidosis, systemic sclerosis, organ transplant rejection (GVHD) and chronic inflammations. Conjugate administration is typically continued until symptoms of the disease state are reduced or eliminated, and the conjugate can be administered in combination with any additional therapeutic factor, such as a chemotherapeutic agent (e.g., paclitaxel). The conjugates administered in accordance with the methods of this invention are preferably administered parenterally to the animal or patient suffering from the disease state, for example, intradermally, subcutaneously, intramuscularly, intraperitoneally, or intravenously in combination with a pharmaceutically acceptable carrier. Alternatively, the conjugates can be administered to the animal or patient by other medically useful procedures and effective doses can be administered in standard or prolonged release dosage forms. The therapeutic method of the present invention can be used alone or in combination with other therapeutic methods recognized for treatment of macrophage mediated disease states. Compounds 5, 7, and 9 (see schemes 2 and 3) were prepared as follows. First, compounds 1 and 2 (fourty-five μmoles of each) were mixed with stirring under argon with 1 mL of anhydrous methanol. After stirring for 20 hours, both starting materials disappeared as determined by TLC (silica gel; CHCl3/MeOH=9/1). To prepare compound 5, in a separate flask 1.0 mL of deionized water was added to fourty-two μmoles of compound 4 and the solution was purged with argon. To this solution was added 0.1 N NaHCO3 until the pH was adjusted to 7, and this solution was mixed with the first reaction solution described above (prepared by mixing compounds 1 and 2). The conjugation reaction was completed in 30 minutes. The methanol was evaporated i.vac. and the conjugate was purified on preparative HPLC (Prep Novapak HR C18 19×300 mM column; mobile phase (A)-1.0 mM phosphate buffer, pH=6; organic phase (13)-acetonitrile; conditions-gradient from 99% A and 1% B to 50% A and 50% B in 30 minutes, flow rate=15 mL/minute). Compounds 7 and 9 were prepared using the same protocol except that compounds 6 and 8, respectively, were used in the second solution in place of compound 4. Compounds 5, 7, and 9 were identified by 1D (FIG. 5) and 2D NMR (FIG. 6) and MS (ES). A compound denominated as EC72 (see scheme 1) was evaluated using an in vitro cytotoxicity assay that predicts the ability of the drug to inhibit the growth of folate receptor-positive KB cells. This compound comprises a folate analog linked to mitomycin C prepared according to the protocol depicted in scheme 2. The KB cells were exposed for 15 minutes at 37° C. to the indicated concentrations of EC72, free mitomyicn C (drug #1), or to EC72 and at least a 100-fold excess of folic acid. The cells were then rinsed once with fresh culture medium and incubated in fresh culture medium for 72 hours at 37° C. Cell viability was assessed using a bromodeoxyuridine-based ELISA assay. When compared directly, the cytotoxicity of EC72 was equal to that of free mitomycin C (see FIG. 1). The cytotoxicity of EC72 was blocked in the presence of excess free folic acid, indicating that the observed cell killing was mediated by folate binding to its receptor. Importantly, this result also suggests that normal tissues that express little to no folate receptor should not be affected by the EC72 conjugate. The effectiveness of EC72 for promoting survival of tumor-bearing mice was evaluated in vivo using M109 tumor-bearing Balb/c mice. There were two goals of this study: i) to determine if daily intraperitoneal treatment with EC72 could prolong the lives of folate receptor-positive tumor-bearing mice beyond what mitomycin C could do when tested under an identical dosing regimen, and ii) to examine the pathological effects of EC72 treatment on normal tissues, including kidney tissue which is folate receptor-positive tissue. Although most normal tissues contain very low levels of folate receptor, the proximal tubules of the kidney express appreciable numbers of folate receptors. Thus, the in vivo evaluation of EC72 also enabled evaluation of the extent of kidney-specific damage caused by the systemic administration of folate-mitomycin conjugates. Balb/c mice (5 mice/group) were given an intraperitoneal injection with 1×106 M109 cells. The mice were then given an intraperitoneal injection once daily with 1800 mmoles/kg of EC72 or mitomycin C (control mice were injected with PBS) beginning on day 5 after tumor cell innoculation (ILS=increased life span (i.e., median survival time)). As shown in FIG. 2, all control mice died by day 22 post tumor inoculation. While a 39% increase in lifespan (ILS) was observed for the animals treated with unmodified mitomycin C, the animals treated with EC72 had an average of a 178% increase in life span. The same experiment (except that 30 daily injections with EC72 or mitomycin C were given) was repeated to confirm the observed EC72-mediated anti-tumor activity, and to confirm whether the effect of EC72 was mediated by folate binding to its receptor. Thus, a group of animals were given intraperitoneal injections of EC72 plus a 10-fold excess of free folic acid. As shown in FIG. 3, the group of animals treated with EC72 showed the greatest increased life span (i.e., median survival time; 185% over those of the PBS control group), while the animals in the mitomycin C group showed only an approximate 25% increase. Furthermore, 1 of 4 EC72-treated animals emerged tumor-free by day 70 post tumor cell inoculation. The anti-tumor effect of the EC72 conjugate was significantly reduced (112% increase in median survival time) by the coinjection of a moderate excess of folic acid, and all mice in this group eventually died from the tumor burden. Major organs were also collected in both the EC72 and mitomycin C-treated animals (following euthanasia), and they were sent to an independent pathologist for examination. As described in Table 2 below, the mitomycin C-treated animals suffered from extensive myelosuppression, which is a characteristic side effect of mitomycin C therapy. In fact, all of the animals in this group died from apparent mitomycin C-related side effects. Surprisingly, animals treated with EC72 displayed no evidence of myelosuppression or kidney damage (i.e., the spleen, femur bone marrow and kidneys all appeared normal to the experienced pathologist). Interestingly, examination of blood collected from EC72 treated animals indicated normal blood-urea-nitrogen and creatine levels following 30 consecutive daily injections with EC72. Thus, folate-mitomycin C conjugates appear to be effective chemotherapeutic agents that do not cause unwanted injury to normal tissues, including the folate receptor-positive kidneys. The anti-tumor activity of EC72 when administered intravenously (i.v.) to tumor-bearing animals, was evaluated in Balb/c mice bearing subcutaneous M109 tumors. Thus, a protocol similar to that described in Example 3 was followed except that the compounds were administered i.v. (described below) and the tumors were subcutaneous. Four days post tumor inoculation in the subcutis of the right axilla, mice were injected i.v. qd×5 for six weeks with 1800 nmoles/kg of EC72. Tumor growth was determined at 2-day intervals in each treatment group until the tumors grew to at least 1500 mm3. The tail veins became excessively bruised and inaccessible after 12 i.v. injections so dosing was continued i.p. following the same qd×5 schedule. As shown in FIG. 4, EC72 treatment was effective in delaying the growth of the M109 tumor. Interestingly, the tumors did begin to increase their growth rate shortly after the switch was made to i.p. dosing. Thus, EC72 may not have reached the distal subcutaneous tumor efficiently following i.p. administration of EC72, a limitation not encountered when EC72 was administered i.v. during the initial phase of the therapy. The protocol described in Example 4 was followed except that mice were injected i.v. throughout the treatment period and were treated with EC72 for 4 weeks. Balb/c mice (n=5) were injected subcutaneously in the subcutis of the right axilla with 1×106 M109 cells and were treated qd×5 for 4 weeks with 1800 nmol/kg of EC72. EC72 was administered i.v. beginning on the designated day post tumor cell inoculation (PTI; see Table 3). Animal survival was monitored daily, and mice showing a complete response were those that were tumor-free at day 60 PTI. In the subcutaneous tumor model, survival declined with the length in delay of EC72 administration. Thus, as summarized in Table 3, performance was maximal if treatment with EC72 began 1 day PTI, where 2 of 5 complete responses resulted and 3 of 5 animals had a 133% increase in lifespan (ILS; i.e., partial response). In contrast, delaying EC72 treatment until 12 days PTI resulted in only an 8% ILS with 0 of 5 complete responses. Also, median survival time (days) and % ILS decreased with an increasing delay in initiation of EC72 treatment. The protocol described in Example 5 was followed except that animals were injected i.v. at the beginning of the treatment period and were injected i.p. later in the treatment period. To investigate whether EC72 and TAXOL® in combination might effectively increase survival of mice bearing solid tumors, subcutaneous M109 tumors were formed in Balb/c (n=5 for each treatment group) mice for 12 days (i.e., a time PTI when initiation of treatment with EC72 alone was ineffective (see Table 3)). The mice were then treated with TAXOL® (i.e., paclitaxel) with or without EC72, and both primary tumor volumes and survival of the animals were measured. Twelve days PTI, the mice were treated with TAXOL® (20 mg/kg, i.v. on days 12, 15, 19, 22, and 26 PTI) with or without EC72 (1800 nmol/kg qd×5 for 4 weeks; i.v. on days 12, 15, 19, 22, and 26 PTI, and i.p. all remaining days). Tumor volumes were calculated using the equation V=a×b2/2, where “a” is the length of the tumor and “b” is the width expressed in millimeters. The tumors were measured using calipers. As shown in FIG. 7, tumors in untreated control animals grew rapidly, and by day 50 PTI, they reached a size where euthanasia was required. Tumors in TAXOL®-treated animals failed to grow until day 29 PTI, after which they resumed growth. Although treatment with 20 mg/kg of TAXOL® alone resulted in a 1.3 log cell kill (LCK), the animals treated with TAXOL® alone appeared sick, experienced weight loss, and none of the 5 mice in the cohort were long term survivors. In contrast, tumors in mice treated with TAXOL® and EC72 in combination decreased in size during the dosing period, and this regimen resulted in a 1.8 LCK in 3 of the 5 mice in this cohort, and 2 of 5 mice were tumor-free at 90 days PTI. Furthermore, all of the mice treated with TAXOL® in combination with EC72 maintained their weight and appeared healthy throughout the dosing period. These results show that EC72 and TAXOL® act synergistically to prevent tumor growth because EC72 alone failed to produce an anti-tumor response in this subcutaneous tumor model when EC72 treatment was initiated 12 days PTI (see Table 3), and the response with EC72 and TAXOL®D in combination was much greater than with TAXOL® alone. The procedure described in Example 6 was followed except that TAXOL® was dosed at 15 mg/kg and 6 mice/cohort were tested. As shown in FIG. 8, tumors in untreated control animals grew at an exponential rate, and by day 50 PTI, they reached a size where euthanasia was required. In contrast, tumors in TAXOL®-treated mice failed to grow until day 21 PTI, after which they resumed apparent normal exponential growth. TAXOL® therapy resulted in a 0.6 LCK with a 135% increase in mean survival time in 4 of the 6 treated animals, and 2 of the 6 mice were complete responders (see Table 4 where CR=complete response, PR=partial response, and NR=no response). As in Example 6, strikingly better results were obtained with the TAXOL®-treated animals that were also treated with EC72. Thus, the combination of TAXOL® and EC72 produced a 1.5 LCK with a 185% increase in mean survival time in 2 of 6 mice, and, importantly, 4 of the 6 mice were complete responders (see FIG. 8 and Table 4). Taken together, these results and the results shown in FIG. 7 demonstrate that TAXOL® and EC72 act synergistically to inhibit tumor growth. The toxicity of each tested regimen was also monitored by measuring weight loss, blood chemistry, and tissue pathology. Animals treated with TAXOL® in combination with EC72 appeared healthy and did not lose weight throughout the dosing period. Also, the tissue pathology results from the mice treated with TAXOL® and EC72 confirmed that there was no major organ degeneration in these animals (Table 5). The affinity of EC72 for folate receptors (FRs) relative to folate was determined according to a previously described method (Westerhof, G. R., J. H. Schomagel, et al. (1995) Mol. Pharm. 48: 459-471) with slight modification. Briefly, FR-positive KB cells were gently trypsinized in 0.25% trypsin in phosphate-buffered saline (PBS) at room temperature for 3 minutes and then diluted in folate-free RPMI (FFRPMI) containing 10% heat-inactivated fetal calf serum (HIFCS). Following a 5 min 800×g spin and one PBS wash, the final cell pellet was suspended in FFRPMI 1640 (no serum). Cells were incubated for 15 min on ice with 100 nM 3H-folic acid in the absence and presence of increasing concentrations of EC72 or folate. Samples were centrifuged at 10,000×g for 5 min, and then the cell pellets were suspended in buffer, transferred to individual vials containing 5 mL of scintillation cocktail, and then counted for radioactivity. Negative control tubes contained only the 3H-folic acid in FFRPMI (no competitor). Positive control tubes contained a final concentration of 1 mM folic acid, and CPMs measured in these samples (representing non-specific binding of label) were subtracted from all samples. Notably, relative affinities were defined as the inverse molar ratio of compound required to displace 50% of 3H-folic acid bound to the FR on KB cells, and the relative affinity of folic acid for the FR was set to 1. As shown in FIG. 9, EC72 has a relative affinity of 0.59, indicating that this conjugate can effectively compete with folic acid (the native ligand) for binding to the folate receptor. KB cells were seeded in 12-well Falcon plates and allowed to form near-confluent monolayers overnight. Following one rinse with 1 mL of fresh FFRPMI/HIFCS, each well received 0.5 mL of FFRPMI/HIFCS containing increasing concentrations of EC72 in the presence of absence of 0.1 mM folic acid (competitor). Cells were incubated for 15 min at 37° C. and then rinsed four times with 0.5 mL of FFRPMI/HIFCS. 0.5 mL of fresh FFRPMI/HIFCS was then added to each well, and cells were chased for a total of 72 h at 37° C. Two hours before the end of the incubation, media was replaced in each well with 0.5 mL FFRPMI/HIFCS containing 5 μCi of 3H-thymidine. Monolayers were then washed 3 times with 0.5 mL of PBS and then precipitated with 1 ml of 10% cold trichloroacetic acid. The trichloroacetic acid solution was collected and discarded, and precipitated material was sequentially dissolved in 0.5 mL 0.25 N NaOH and 1% sodium dodecyl sulfate for 15 min at room temperature. Samples were then counted for radioactivity using a Packard gamma counter. Final tabulated values were expressed as a percentage of radioactivity incorporated into untreated cell samples. As shown in FIG. 10, EC72 displays high, dose-responsive activity against FR-positive KB cells (IC50 5 nM), and the activity is specific since an excess of free folic acid effectively blocked any DNA synthesis inhibition. Six to seven week-old mice (female Balb/C strain) were obtained from Harlan, Inc., Indianapolis, Ind. The mice were maintained on Harlan's folate-free chow for a total of three weeks prior to the onset of and during this experiment. Folate receptor-positive M109 P0 tumor cells (0.5×106 cells per animal) were inoculated in the upper peritoneal cavity 4 days prior to the onset of dosing. The formulations indicated in FIG. 11 were dosed intraperitoneally qd×30 starting on day 4 post tumor inoculation, and animal survival was monitored daily. EC72 displayed dose-dependent activity in M109 tumor-bearing mice. At the 1800 nmol/kg dose level of EC72 (saturable to folate receptors in vivo), a 240% increase in lifespan was observed with 1 of 4 animals showing a complete response. Six to seven week-old mice (female Balb/C strain) were obtained from Harlan, Inc., Indianapolis, Ind. The mice were maintained on Harlan's folate-free chow for a total of three weeks prior to the onset of and during this experiment. Folate receptor-negative 4T-1 tumor cells (1×106 cells per animal) were inoculated in the subcutis of the right axilla. The formulations indicated in FIG. 12 were dosed intraperitoneally qd×30 starting on day 4 post tumor inoculation, and tumor volume as well as animal survival were monitored daily. EC72 had no activity against a subcutaneous folate-receptor-negative 4T-1 tumor. wherein the group X comprises a mitomycin compound, or an analog or a derivative thereof. 2. The conjugate of claim 1 wherein the vitamin is selected from the group consisting of folate, riboflavin, thiamine, biotin, vitamin B12, and analogs or derivatives thereof. 3. The conjugate of claim 1 wherein the linker is cleaved under reducing conditions. 4. The conjugate of claim 3 wherein the linker is a disulfide group. 5. The conjugate of claim 1 wherein the mitomycin is selected from the group consisting of mitomycin A, mitomycin B, mitomycin C, mitomycin D, mitomycin E, mitomycin F, and porfiromycin. selectively eliminating said population of pathogenic cells. 7. The method of claim 6 wherein the vitamin is selected from the group consisting of folate, riboflavin, thiamine, biotin, vitamin B12, and analogs or derivatives thereof. 8. The method of claim 6 wherein the linker is cleaved under reducing conditions. 9. The method of claim 6 wherein the linker is a disulfide group. 10. The method of claim 6 wherein the mitomycin is selected from the group consisting of mitomycin A, mitomycin B, mitomycin C, mitomycin D, mitomycin E, mitomycin F, and porfiromycin. 11. The method of claim 6 wherein the population of pathogenic cells is a cancer cell population. 12. The method of claim 6 further comprising the step of administering to said host a therapeutic factor selected from the group consisting of a cell killing agent, a tumor penetration enhancer, a chemotherapeutic agent, a cytotoxic immune cell, and a compound capable of stimulating an endogenous immune response. 13. The method of claim 12 wherein the therapeutic factor is a chemotherapeutic agent. 14. The method of claim 13 wherein the chemotherapeutic agent is paclitaxel. a pharmaceutically acceptable carrier therefor. 16. The composition of claim 15 wherein the vitamin is selected from the group consisting of folate, riboflavin, thiamine, biotin, vitamin B12, and analogs or derivatives thereof. 17. The composition of claim 15 wherein the linker is cleaved under reducing conditions. 18. The composition of claim 17 wherein the linker is a disulfide group. 19. The composition of claim 15 wherein the mitomycin is selected from the group consisting of mitomycin A, mitomycin B, mitomycin C, mitomycin D, mitomycin E, mitomycin F, and porfiromycin. 20. 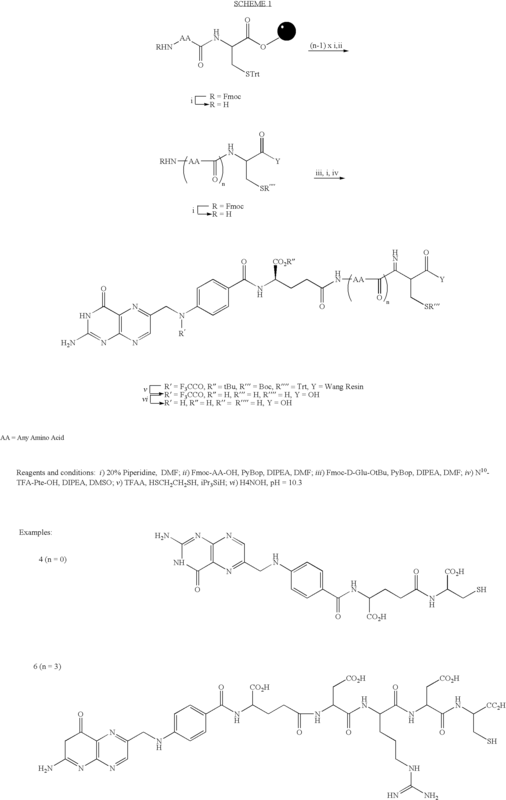 The composition of claim 15 further comprising a therapeutic factor selected from the group consisting of a cell killing agent, a tumor penetration enhancer, a chemotherapeutic agent, and a compound capable of stimulating an endogenous immune response. 21. The composition of claim 20 wherein the therapeutic factor is a chemotherapeutic agent. 22. The composition of claim 21 wherein the chemotherapeutic agent is paclitaxel.